Are you looking to take advantage of social media for your business or organization? 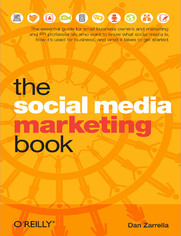 With easy-to-understand introductions to blogging, forums, opinion and review sites, and social networks such as Twitter, Facebook, and LinkedIn, this book will help you choose the best -- and avoid the worst -- of the social web's unique marketing opportunities. The Social Media Marketing Book guides you through the maze of communities, platforms, and social media tools so you can decide which ones to use, and how to use them most effectively. With an objective approach and clear, straightforward language, Dan Zarrella, aka "The Social Media &amp; Marketing Scientist," shows you how to plan and implement campaigns intelligently, and then measure results and track return on investment. Whether you're a seasoned pro or new to the social web, this book will take you beyond the jargon to social media marketing mastery.